Apologies for the lack of posts in the last couple weeks. Schedule has been hectic and my laptop is increasingly difficult to lug around. Since my last post I have visited Boston – the city’s leaves were right in the middle of changing colors and the atmosphere was just beautiful. I had the pleasure of interviewing a diversity of Sikhs in Boston. Perhaps the most poignant stories came from previously non-Sikhs who came to the faith through their own means – through self-discovery and information they gathered from classes or peers, not through a particular figure or because they were born into the faith. Their take on Sikhi was culture-free and focused on principles and values and gurbani. It was refreshing to speak with these individuals. I am now in North Carolina and am looking forward to the stories I encounter here! “Diversity” – Japanese, Sikh, American? 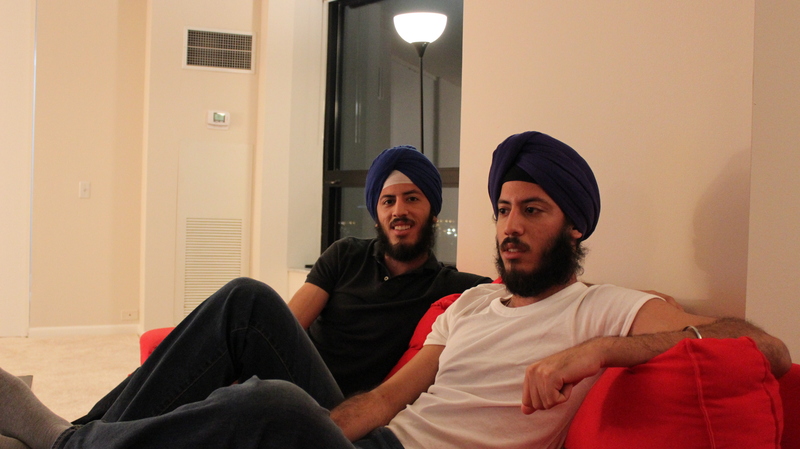 Had some awesome conversation with Dharam& Karam – 22 year old Sikh twins, born and raised in Japan, came to the US for college and now working in the same company with the very same job here in Chicago! Most interesting observation: In Japan, they didn’t feel their identity as much as they do here in the US. The Japanese viewed the brothers and the Sikh community in general as “foreigners” in Kobe, Japan. In the American college setting however, they were in some ways forced to identify themselves beyond “not Japanese.” They felt their brown skin and turbans and beards just a little more than they had in the past. Being friends with Indians and international students was easier just because there was a default of shared identity and a shared connection. True, America is diverse, but we have to identify our particular diversity. We are yet not blind to color. Last weekend, I visited Oak Creek Gurdwara. I came at a time of tension. The picture below illustrates the issue bluntly. 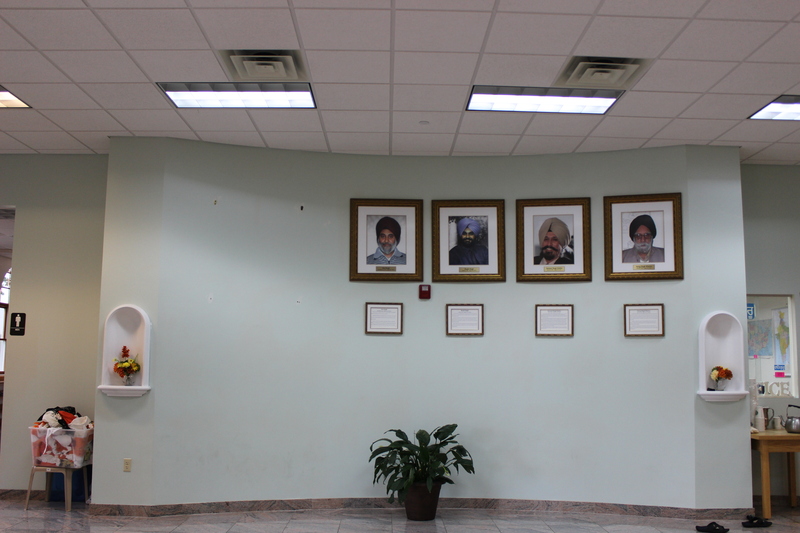 A year ago, the Gurdwara decided to put up pictures of the six victims in the lobby of the Gurdwara. The pictures stayed for a year. Now, however, two have been taken down. Why? Threats to the victims’ families. Sangat who don’t want to see the pictures before going into the main hall. A compromise gone weary – the pictures were supposed to be moved to the langar hall along with other pictures from Sikh history. A plethora of reasons, all charged with validity and passionate emotion. I bring this particular case up to illustrate a trend I have seen in every single community I have visited thusfar – “gurdwara politics.” It’s not new. Conferences have been organized to talk about it. Youth are noticing. Big time. And egos are getting scarred. I don’t know if it’s a product of a generation turning back to its roots to find identity or the fact that I’m part of the generation challenging and problematizing gurdwara boards’ and trustees’ decisions, but I am noticing a fast-growing dissatisfaction with the way in which gurdwaras are run and the services they provide. Uncles don’t want to give up their power. Half the time they’re in business with some other men on the board. Aunties gossip for no reason but boredom perhaps. Domestic violence victims have no place to turn for help. Initiatives led by kids are turned down for no reason but the assumption youth are too naïve to offer anything useful. No one is thinking about the future. No one is stopping to assess the purpose and function of the gurdwara. Youth is though. And it’s finding major problems. Some are doing something about it – discussions, trips to the park, shabad translations in English, kirtan classes; but others are just turning away. What will the Sikh population become if the very kids who are supposed to frequent our gurdwaras in fifty years are being turned off at the age of 15? One of the most explicit challenges in my journey thus far has been getting in touch with Sikhs outside the “middle class.” The term middle class itself means quite a few different things and has many self-identifiers. I view the middle class as those fortunate enough to provide a sustainable lifestyle for themselves, those who have established themselves in these Americas and are living decently above the poverty line. It’s easy getting in touch with this class. Most of my contacts and their networks fall within the lifestyle rings that identify as middle class. But middle class does not define all Americans and it definitely does not define all Sikhs here in America. So many Sikhs, like any other demographic are still facing everyday struggles to make enough money to put food on the table for their families. Hopes of opportunity and new life is what brings people to America, but what happens when the capitalist dream requires capital – economic, symbolic, or cultural? Sometimes, the capital just doesn’t add up in the best way. Taxi cab drivers, truck drivers, gas station workers, day laborers, farmers – these are all occupations that contribute to the makeup of the Sikh American population. We aren’t all “professionals” in the quotidian use of the term. These are populations I cannot necessarily contact through email or even in English. I need phone numbers, guides, and people more integrated than I to talk to the men, women and children of the Sikh working class. This is harder than I thought it would be but it is now becoming a significant focus of my documentation efforts. P.S. An anonymous comment on the “Gurdwara Politics” post pointed out that I may not have contextualized my particular background as well as I could have. Thank you for the comment. I do come from that ‘middle class’ background. I recognize the privilege that such a background gives me and I am hoping to break down and understand that privilege on this journey. I am undertaking this project because I want to capture the stories of all Sikhs – regardless of socioeconomic background and as part of that goal, there are real and practical obstacles to accessing individuals of different class, education, cultural, and language backgrounds. It’s a learning experience and I hope that this blog enables others to learn with me. What does Sikhi mean in our lives? esterday, Jasvinder Singh from Minnesota shared with me the reason he has chosen to go to med school. He said, “I can’t do anything less than changing people’s lives.” He could not think of a greater seva than saving lives, changing lives, and healing the hurt. Through my conversations and observance, many people view Sikhi as a value system, a set of guidelines to follow. In several interviews, I have had the privilege of hearing how individuals have struggled with that value system, with the logic that Sikhi gives us. This might mean challenges with hair, with drinking, with choosing the right career path, with finding a way to incorporate seva into their lives, and even with understanding what it really means when we’re told our Gurus were rebels and curious questioners. Jasvinder, in some ways, solved some of his struggle. He is using the value system he gleaned from his Sikh upbringing by choosing a career path that he feels will help people and will do good in this world. This was an active decision. True, it was a product of his environment, his parents, his community, the needs he sees in the world, and his personal merit. But Sikhi can weave into all of this. Jasvinder demonstrates that. And it’s a beautiful thing. Maybe he has other struggles or questions or doubts; but Jasvinder found strength and purpose in pursuing the medical field because it made sense within his value system, a value system guided by the Gurus. It’s awesome to see this, but I also must keep in mind that as I journey through the United States, that there are many ways that Sikhi may manifest itself in peoples lives. Some may find strength in the values; others may reject them, question them constantly, or not even recognize them at all. I am not here to judge anyone’s connection with Sikhi. Rather, my job is to record all the ways people may identify as Sikh or recognize a certain connection with the community or faith. Seeking the nuances and variants will hopefully enable me to understand what it really means to be Sikh in America. *seva translates into ‘selfless service’ and is one of the tenets of Sikhi. Humans have been born with the gift of thought and language. Talking is organic. However, the setting of an interview – with metal and plastic recorders or video cameras all pointed at one person – makes talking feel a little contrived. Thus, interviewing requires patience, insight, awareness, and genuine interest. It also demands a level a confidence to create an environment of trust and comfort. Words, body language, eye contact – everything affects the space of the interview. I am in the process of learning to balance all of these factors and I can only hope that with each interview, I get a little better. But it’s still Week 1. Despite all the mishap, I have had the opportunity to hear stories of violence: stories of both the struggle and opportunity that immigration incites. Individuals have shared feelings of resentment against the Sikh community, but others have also described elements of Sikhi that strike at the very core of their beings. I feel blessed to be able to hear these stories, to see people’s emotion cross their eyes and brows. The journey continues with just a few days left in the DC-Maryland-Virginia area. And then off to Minnesota! Officially funded, with a logo, and already on the road! Despite a lack of posts, the Sikh Monologues Project has made some amazing strides this summer. First, we are incredibly proud to announce that the Sikh Spirit Foundation (SSF) has graciously offered us a grant of $5,000 to get our vision up and running! SSF is not only helping us financially, but is also connecting us with awesome people who are going to be supporting our project from start to finish through mentorship. It is so exhilarating to know that we have an organization who not only believes in our vision but is willing to invest into it. Lastly, the project is now live – as in I am on the road at my first stop in Washington, DC! Dilroop and I will be covering the DC, Maryland and Virginia sangats in the next two weeks. I have my brand new Canon T3i in tow for videoing my experiences, a Tascam DR-05 for high quality recording of interviews, and steadfast belief that this project is going to be invaluably enlightening for myself and the Sikh community. Just as a heads up, this is my schedule for the next month! Please don’t hesitate to e-mail sikhmonologues@gmail.com with any questions or suggestions! We’re going to monologue for a year! Jasleen and Dilroop here – we’re the awesome masterminds behind “The Sikh Monologues.” But really, we’re just a couple of young women who came up with a creative idea to write a series of monologues based on the stories of the Sikh American community. We’re going to go around the country, interview Sikhs and then base monologues off of the themes that the interviews cover. And then we’re going to publish them. Simple. Sort of. This blog will document our trials and tribulations through this year-long process. Check back here as we embark on an unforgettable and vital journey of hearing and preserving the voices of Sikhs in America. We’re going to be traveling, dealing with publishers, writing, editing and constantly communicating with the very people that inspired the project – our community. Lots of love and wish us luck!